Acrylic paint on cloth over wood; acrylic paint on card over steel tube. Hang up is great piece of installation that blurs the boundaries of sculpture and painting, the two ideas are merged. 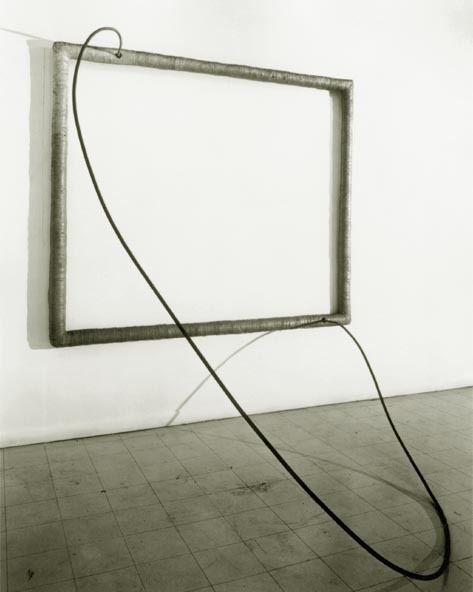 The frame has no painting so the empty space becomes a part of the installation. 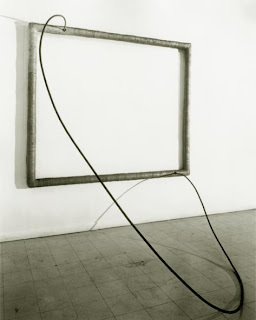 ‘Steel rod coated in bandage like cloth extends from a carefully spaced frame.’ I like the way the steel rod is appearing to come way from the frame. 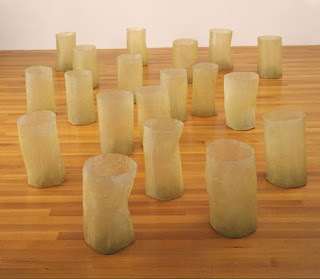 Eva Hesse, Repetition Nineteen III, 1968, latex and filler over canvas stuffed with polyethylene sheeting, rope and unidentified materials. 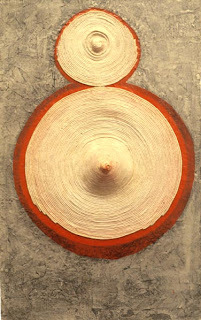 I feel that Hesse’s Repetition Nineteen installation are apparatus in expressing her feeling of emptiness. Pencil, acetone, enamel paint, ink and cloth-covered electrical wire on papier-mch and Masonite. I think Hesse’s pregnant friend at the time Rosie Goldman influenced her to make Ringround Arosie master piece because it is a pattern which 'we all fall down' as women. This is also reflected in the warm colour scheme. A quote from Hesse "I think the circle - it was very abstract. I could make up stories of what the circle means to man but I don't know if it was that conscious. I think it was a form, a vehicle it wasn't a circle representing life and eternity. I think that's would be fake."